Adventures in cyberspace. In which I venture into the dug’s den … | The Nation said No Thanks! If you suspect my prècis is a parody too far, this is the point at which I grit my teeth and in the spirit of openness that characterises cyberspace, provide you with a link to the article concerned. 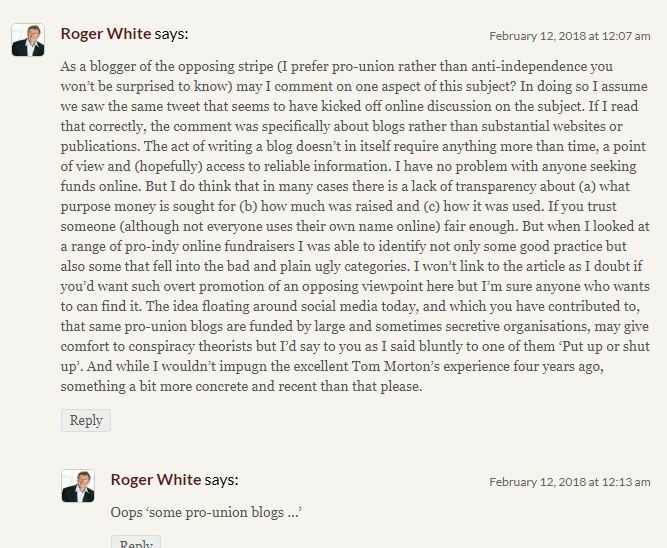 If you venture through to look at it (don’t feel you have to), you’ll also find the claim, on the basis of what one individual wrote in an independence-supporting magazine, that an anonymous group approached a number of people in 2014 to write pro-union blogs for cash. The person sending those tweets is a nationalist but her comments seem reasonable to me, and since she cites me in evidence, I feel justified in reproducing her thoughts here. She’s correct about me, by the way. You’ll see no ‘Donate’ button (as is self-evident) and no shady backer – or anyone – has ever offered me money to write this blog, which I do in my own time. It was born of frustration during the 2014 referendum campaign and it continues because those who promised a ‘once in a generation’ opportunity lied, and continue to lie, about separation. Reasonable? I hope so. And in fairness to the dug he published it. Meantime, his article was gathering a lot of comment, some of it from nationalists also concerned about aspects of fundraising. One thanked me for my comments (‘Nice to hear an opposing view’), I assume not ironically. One doughty individual had a go for a while at reinforcing my comments but, like me, was received frostily. The discussion veered off, as these things tend to, into scarcely-related territory and what passes for banter. “the bad and plain ugly categories”. Really, Mr White, really? The comment didn’t appear although a number of other people’s contributions popped up. What the dug may not know is that I use the same blogging software as him, so I could see that it was ‘Waiting in moderation’, the jargon WordPress use for comments a blogger has yet to approve. After about twelve hours it disappeared, never to be seen on the dug blog. Luckily I saved a draft. A further brief contribution was also zapped. In response to my original comments, the dug had replied ‘I didn’t see the original tweet as I no longer engage with twitter.’ I had tried to chide him about his claim since his Twitter account is still there, although he’s blocked me from viewing it. A sneak peek revealed he’s tweeted several times already in February. Meantime, and irritatingly, another commentator has challenged me on the dug’s blog. Thanks ‘Ian’ but I won’t be able to respond since the mutt doesn’t seem to want me around. You see, the dug bottled it. He let a yoon in, presumably in the hope of some canine-inspired sport, but wouldn’t let the yoon defend himself when he was asked a direct question. I can only assume that like many pets who are made hygienic for modern living, the dug has had his op and is no longer in possession of his cojones. 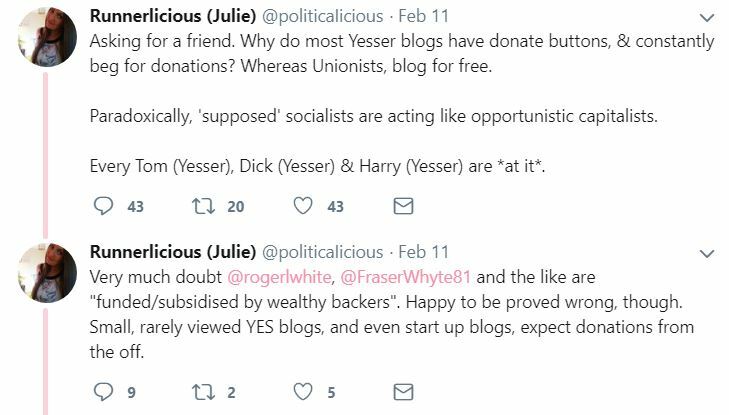 PS – more important than any of this is the dodgy behaviour of some online separatists around fundraising (see links above to previous posts on this blog). To purloin a phrase used by the dug I’m ‘not pointing any fingers at any individuals’ but I wonder how many donations he gets on his blog and how he accounts for that money. This entry was posted in Uncategorized and tagged blogs, facts, fundraising, myth, nationalism, separation, Twitter. Bookmark the permalink. I write a Word Press blog, though not about Scottish politics. I pay Word Press £9.61 p.a to call it https://warandsecurity.com/ rather than https://warandsecurity.wordpress.com/ on top of which my bank charges me a £0.28 foreign currency handling fee. I pay a UK company £11.99 p.a. for warandsecurity.com and £7.99 for warandsecurity.co.uk. The total cost of my blog is therefore £29.87 p.a. If I was happy to call it http://warandsecurity.wordpress.com it would be free. It is possible to use Word Press software on a hosted website, which gives more flexibility in design and costs more but allows the blogger rather than Word Press to receive any advertising revenue that the site generates. WGD uses a Word Press hosted blog (https://weegingerdug.wordpress.com/) but has recently acquired a .scot web address. The costs of the WGD website cannot exceed mine and are probably less, since I own 2 web addresses and the .com one is surely more expensive than the .scot one. There is also a time cost for a blogger. Mine is effectively zero since I am retired and have a pension. WGD blogs a lot more than me and may be giving up some paid work by blogging. So his ongoing web expenses must be minimal. He does of course have a ‘Donate’ button on his blog, unlike either of us. Thanks Roger. One thing… I was at a local SNP function in November 2016 where Mr Kavanagh was guest speaker…. entry was by donation, money put into a collection box type thingy as you went in, as was anything received from the sale of his books ‘n’ stuff. This receptacle was picked up by WGD before he started his talk. There was about 60 people there and I cannot say with hand on heart how musch money was taken, but a £5 seemed to about the average. How much money was in the box at the end of the night? No idea. He was very entertaining BTW, as I said in one of my not deleted posts on his blog, he is long on style, short on facts and substance. I am banned from attending any more local SNP meetings here… pity as Michael Russell is coming to town on Thursday… where’s my Guy Fawkes mask? I’m small fry, decidedly so, but I put in my tuppenceworth and replied to the WGD’s statement: “When was the last time…… yours truly were on the telly talking about independence? Yeah. Exactly.,” the insinuation being that only Unionists got air time. I pointed out to him that perhaps if he did not put up so much inaccuracies/lies in his blogs, then he might get the invite he was so clearly fishing for. I gave examples. His Head Office in London- Scottish VAT, income tax, company tax credited to England, not Scotland nonsense, the “export tax on whisky” stooshy. All wrong wrong wrong I said. Cue insults and accusations and the usual adhom stuff that these guys resort to. So, over to the FAQs on ScotGov page and did a C&P proving my facts on the above were truthful and correct and stuck it on the blog. Nothing. Not printed. When you know they lie, and YOU know they know they lie, then they are beaten. Yes, you were the ‘doughty individual’ I referred to in this blog post,as you probably guessed! Well done. It doesn’t take some of them long to descend into insult, does it?